That bronzy sun-kissed look has long been associated with health and beauty. Human beings are sun-loving creatures, which makes sense, since countless generations before us have depended on the sun for its warmth, light and nourishment. But, since the 1980s, all of the misguided propaganda about the evils of sun exposure have given rise to an incredibly profitable industry built around methods of “safely” achieving that chestnut look. First came self-tanners, followed by any number of lotions and powders, and now a liquid that can be sprayed onto you in a booth. Spray tanning has become one of the most popular sunless tanning methods. Consumers tend to believe that, if a product is on the market, then it must be safe. Unfortunately, that assumption often turns out to be wrong—especially in the unregulated cosmetic industry—sometimes having disastrous health consequences. And this may be the case with spray tanning. Spray tans are generally considered to be benign cosmetic treatments—but are they REALLY? Have you ever wondered what’s in the brown broth being misted all over you to give you that tropical glow? Well, once you learn what those spray-tanning agents may be doing to your body, your healthy glow may DIM a bit. Before I discuss specific ingredients, I want to address an even more fundamental concern—and the number one reason I am not a fan of sunless tanning. You need sunshine—the real kind—and this is why. Sun exposure in controlled amounts is critical to your health. And the misinformation that all sun exposure causes cancer, which has been promulgated for the past 30 years, has RAISED cancer rates rather than lowering them by making an entire country sun-phobic. And this is just for starters. Vitamin D is the superhero of nutrients, and the best way to get it is from the sun, which causes your skin to manufacture it. Vitamin D levels have been tied to cancer risk—the lower your levels, the higher your risk. Every cell and tissue in your body needs vitamin D to function properly. Research suggests that 85 percent of people may be vitamin D deficient, without even knowing it. And sunless tanning is contributing to this problem. The number one thing I have against sunless tanning is that it offers absolutely NONE of the health benefits you would be getting if you were actually receiving ultraviolet exposure. It gives you the illusion of good health, instead of the real thing. Not only does spray tanning not give you vitamin D, but it may even be damaging your skin’s ability to make vitamin D. More about that later…Vitamin D is so important that I have an entire website devoted to it. Now that we’ve talked about what you’re NOT getting from a spray tan, let’s look at what you ARE getting when you step into that booth. Like most cosmetic products, sunless tanners contain a lengthy list of chemical agents—up to 45 in the case of spray tanners. Many of these agents have never been studied for their long-term effects on human health, because the FDA does not systematically review the safety of personal care products. Since testing is voluntary and controlled by the manufacturers, many ingredients in cosmetic products are not safety tested at all. We simply don’t know what the effects might be—so if you are using cosmetic products, then congratulations, you are an unwitting guinea pig. It is important to understand that, of the 10,500 ingredients used in your sunscreen, shampoo, makeup foundation, and so on, only 13 percent have been reviewed for safety in the last 30 years, according to an Environmental Working Group (EWG) analysis. The reviews that have been done were conducted by a fox in the henhouse—the Cosmetics Ingredients Review, which is run by the cosmetics industry! Not all ingredients need even be mentioned on the label—if they don’t want to include one for some reason, they can just leave it off. Therefore, most personal care product formulations are based on nothing more than marketing success, designed to smell good, look good and feel good when you rub them on your skin, regardless of their impact on your health. So, What’s In that Tanning Spray? Adverse reactions reported by consumers to the FDA after spray tanning include rashes, coughing, dizziness and fainting. It’s possible that any one of these chemicals could be responsible, or any combination of them in the 45-ingredient potpourri. This is not the DHA that is an important animal based omega-3 fat but one of the main ingredients in today’s spray tanning solutions is dihydroxyacetone, a color additive that darkens your skin by reacting with amino acids in your skin’s surface layer. Dihydroxyacetone is often abbreviated DHA, Sunless tanning products often contain between 1 and 15 percent DHA; the higher the DHA level, the darker the tan produced. Manufacturers of sunless tanning products claim DHA is a simple carbohydrate sugar solution, but some toxicologists disagree. Several years ago, Dr. Thomas Pierce, a toxicologist who investigated the harmful effects of some tanning beds, issued a warning that DHA is not as simple or harmless as it may seem. Part of the problem is that the U.S. government’s regulations for DHA allow contaminants such as lead, arsenic and mercury. Lead in particular is known to affect brain development, and no one knows how large the effect may be on your baby, should you be pregnant while spray tanning. If you are pregnant or nursing, I would urge you to stay away from spray tanning for this reason alone. A report by the National Toxicology Program suggests the risks of DHA remain unclear, pointing to some evidence that DHA may be a mutagen that could induce breaks in DNA strands. Another issue is absorption through your skin. You shouldn’t put anything on your skin you wouldn’t feel safe eating. Absorbing chemicals transdermally is actually MORE dangerous than ingesting them orally, because they can be absorbed directly into your bloodstream without any digestive degradation. Digestive acid works, at least in part, to neutralize some chemicals—but this does not occur when you absorb them transdermally, or inhale them, for that matter. For example, by taking a seven-minute shower you are exposed to more chlorine, DPBs, and VOCs than by drinking a gallon of the same tap water. A study performed by the Skin Absorption and Metabolism Section of the FDA, published in the 2004 issue of Toxicology and Applied Pharmacology, found as much as 22 percent of the DHA could be absorbed through your skin, as opposed to merely laying on its surface. This is additional evidence that what you put ON you, goes IN you. But when you have DHA-containing products sprayed on you in a booth, little droplets become suspended in the air all around you, increasing your risk for exposure through your eyes, nose and mouth. Wearing protective gear over your eyes, nose and mouth is extremely important—but it does not remove all the risk. On its research page, the Vitamin D Council lists a pilot study (published in 2009 in the Journal of Photochemistry and Photobiology) that examined the effects of sunless tanning sprays on your skin’s ability to produce vitamin D. The results are alarming. Researchers discovered DHA-containing tanning agents inhibit your skin’s ability to produce vitamin D and called for larger studies to be conducted. When your skin darkens from exposure to sunshine you will have elevated vitamin D levels and the darkening process actually serves to protect you from overdosing on vitamin D.
However, when the dark layer on your skin produced by the DHA results in the prevention of UVB absorption, thereby blocking the creation of vitamin D. Your skin must then repair itself in order to be able to produce vitamin D again, which takes approximately 2 weeks. Many people get a spray tan every week or two, so they are effectively inhibiting their own vitamin D production for weeks or months at a time, exposing themselves to increased cancer risk and a whole host of other problems. Vitamin D levels are already dangerously low in the general public, without adding factors that diminish them even further! More than 50,000 people die every year from inadequate sun exposure and insufficient vitamin D.
Another common ingredient in spray tanners is an ether-containing solvent called ethoxydiglycol (or transcutol CG), which is similar to butylene glycol. The MSDS for this chemical warns it is hazardous if ingested or inhaled, may irritate your skin, is dangerous to your kidneys, and it caused infertility and birth defects in animal studies. Ether is known to be carcinogenic and causes developmental and reproductive problems, hormonal disruptions and allergic reactions. Parabens, a group of chemicals widely used as preservatives in cosmetics, have been shown to mimic the action of the hormone estrogen, which can drive the growth of human breast tumors. Studies have shown that parabens can affect your body much like estrogens, possibly leading to diminished muscle mass, extra fat storage, and male gynecomastia (breast growth). Studies have also suggested parabens could be linked to breast cancer, as researchers found traces of parabens in every tissue sampled from 20 different breast tumors. Perfumes and fragrances are the single largest category of cosmetic and personal care products and are a clever way for manufacturers to hide chemical ingredients from you. Each fragrance can contain thousands of different chemical components—it’s virtually impossible to determine what’s actually in them. Two problematic compounds in fragrances are phthalates—which have been linked with endocrine disruption, immunosuppression and cancer—and synthetic musk, which contains a slurry of harmful chemicals. Allergies and chemical sensitivities are extremely common, and fragrances are notorious for triggering them. The FDA allows the fragrance industry to regulate itself, through a trade association known as the International Fragrance Association (IFRA). This association is responsible for conducting safety tests to establish which ingredients are safe to use in their own industry—which should make your warning bells go off. The fragrance industry uses more than 5,000 different ingredients, and only about 1,300 have actually been tested. There are serious questions about whether the industry’s research institute is really as “independent” as IFRA claims. Cosmetic coloring agents in spray tan formulas are dyes unnecessarily added to make you think the tanning is instantaneous. They impart a brown color to the concoction, which immediately turns your skin brown. Some of these absorb into your skin, and others wash off in the shower or rub off on your towel. The coloring agents most often used in spray tanners are Ci 42090, Ci 16255, and Ci 19140. Coloring agents are among the few ingredients cosmetic manufacturers must have approved by the FDA. If the potential health dangers outlined above aren’t enough to scare you, this slideshow of Celebrity Spray Tans Gone Wrong may do the trick. The FDA has never specifically approved the use of DHA for spray tanning. The FDA originally approved DHA in the 1970s for topical application ONLY, but this was long before anyone thought it might be sprayed onto people, thereby coming in contact with their lips, lungs and other sensitive mucous membranes. DHA is listed in the regulations as a color additive for use in imparting color to the human body. However, its use in cosmetics–including sunless “tanning” products–is restricted to external application (21 CFR 73.2150). According to the CFR, “externally applied” cosmetics are those “applied only to external parts of the body and not to the lips or any body surface covered by mucous membrane” (21 CFR 70.3v). The industry has not provided safety data to the FDA in order for the agency to consider approving it for use on these exposure routes, including “misting” from tanning booths. If the answer to any of these questions is “no,” then you are not protected and you should request safety measures to protect your eyes, lungs and mucous membranes. 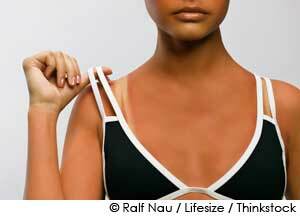 Dr. David Wade, a toxicologist, recommends that you simply walk out of a spray tan establishment if they don’t insist you wear protection. My advice is pretty simple–avoid spray tanning booths and sunless tanning lotions entirely as they provide you with no health benefits, and can actually contribute to worsening your vitamin D levels and are loaded with problematic toxins. A tan obtained by safely exposing yourself to the sun, or a safe indoor tanning system, is health promoting. Saturating your body with potentially toxic chemicals to give it some color is not. Report your reaction online at MedWatch (the FDA Safety Information and Adverse Event Reporting Program), or call them at 800-332-1088 to request a reporting form. Call the FDA district office consumer complaint coordinator for your geographic area.